You’ve heard the exciting news that Royals Prince William and Kate Middleton are to visit India and Bhutan, but what’s their itinerary looking like? 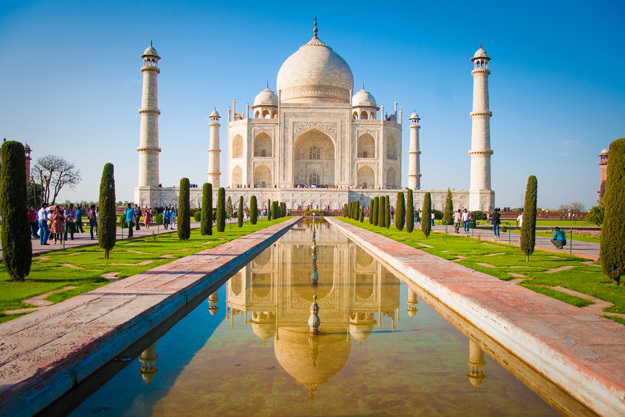 Although a short trip, their week-long tour will explore iconic sights across the two countries, finishing with a visit to the Taj Mahal: the UNESCO World Heritage Site that was once visited by Princess Diana. According to the Mirror, the Royal Couple’s visit will also “contribute to the ongoing partnership between Britain and India and be an opportunity to build on the friendly relations between the UK and Bhutan.” It will also commemorate the Queen’s upcoming 90th birthday. 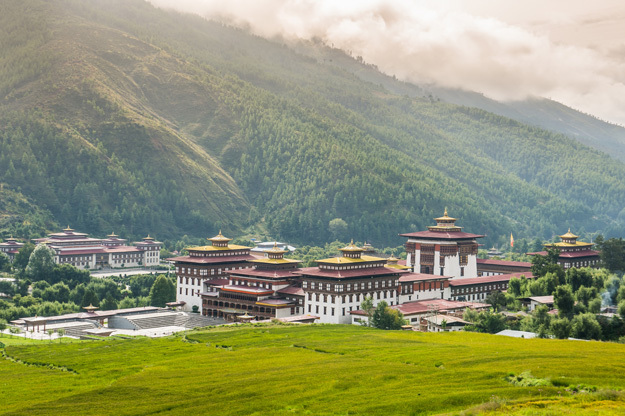 If you’re wishing to book a holiday to India and mysterious Bhutan for yourself, check out our Himalayan Kingdoms escorted tour! On the 10th April 2016, the Royal Couple will arrive in India. A popular destination for the Royal Family for many generations, the visit was first announced when Indian Prime Minister Narendra Modi visited the UK in November 2015 and it will be the first time that Prince William and Kate Middleton will have visited the country. The Prince of Wales and the Duchess of Cornwall visited India in November 2013, and the Queen last visited in 1997. The Royal Couple are set to arrive in Mumbai on April 10th. They have planned to visit Oval Maidan, an oval shaped park in South Mumbai where locals gather in their hundreds to celebrate and play the game of Cricket, before meeting with children and local charities. 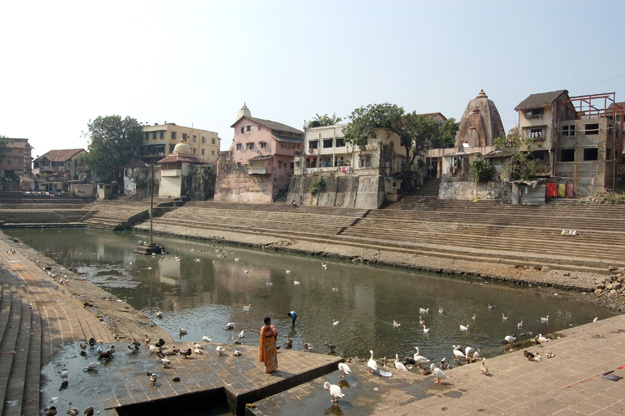 They will also visit the Banganga Water Tank, and ancient tank attached to the Walkeshwar Temple Complex which is dedicated to the Hindu god Shiva. 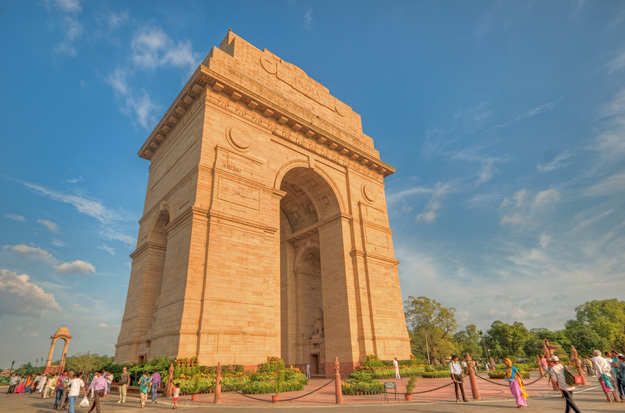 Arriving in Delhi on the 11th April, the Royal Couple will lay a wreath at the India Gate, a war memorial to the thousands of Indian soldiers who died in the First World War. Later, a visit to Gandhi Smitri is planned. A museum dedicated to Mahatma Gandhi, it’s where the influential leader of the Indian independence movement spent the last 144 days of his life. During the 12th and 13th April, Prince William and Kate Middleton will fly to Assam, the state of India famous for its tea plantations. 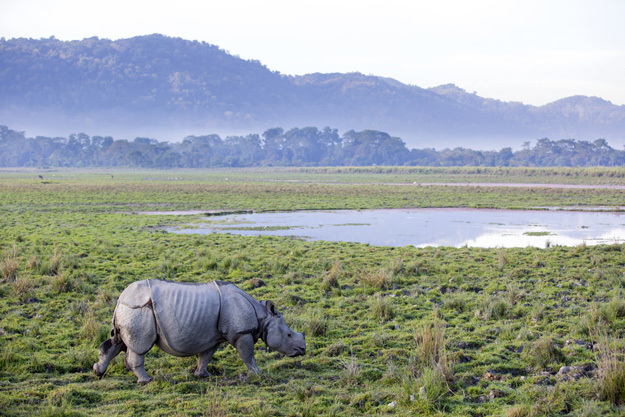 In this Northeast corner of India, they will visit Kaziranga National Park, which holds the largest number of one-horned rhinoceroses in the world. A UNESCO World Heritage Site, the Royal Couple will have the chance to see these rare animals on safari, as well as track wild elephants, tigers, water buffalo and deer. A visit to an elephant sanctuary founded by Mark Shand – the brother of the Duchess of Cornwall – is also planned. You can explore the stunning Kaziranga National Park on a wonderful cruise of India’s Brahmaputra River. On the 16th April after a stopover in Bhutan, the Royal Couple will visit the iconic Taj Mahal, a UNESCO World Heritage Site in Agra. Famously visited by Princess Diana in 1992, the Taj Mahal is a mausoleum completed in 1653 to house the tomb of Mughal emperor Shah Jahan’s favourite wife, and is considered the world’s best example of Mughal architecture. 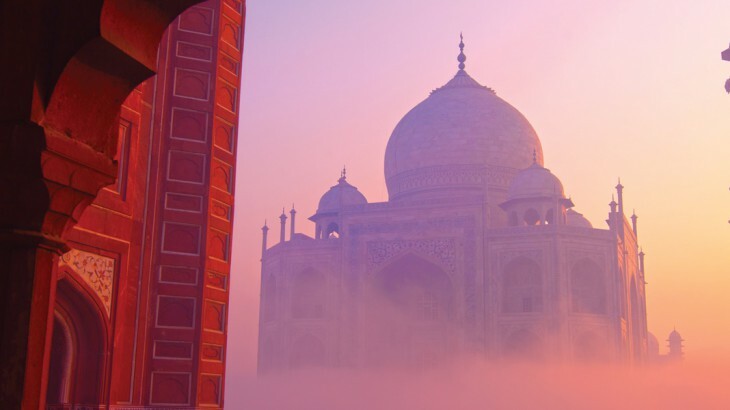 A famous stop on the Golden Triangle of India – connecting Delhi, Agra and Jaipur – the Taj Mahal will be the Royal Couple’s final stop on their week long tour and one that they cannot wait to visit. For two days, Prince William and Kate Middleton will visit the stunning sights of the “Land of the Thunder Dragon:” Bhutan. This little-known, landlocked country of the Himalayas was opened to tourism in the 1970’s, and television was only introduced in the late 1990’s! Inside, the country has a wonderment of natural panoramas and stunning temples ripe for exploration. The country is also famed for its own version of GDP: Gross National Happiness! A constitutional monarchy, Bhutan’s King and Queen will welcome Prince William and Kate to the capital Thimphu in return for the Royal Couple having welcomed them to Clarence House in London in 2011. If a holiday to Bhutan is the adventure you’re seeking, our Land of the Thunder Dragon escorted tour will create memories to last a lifetime. Also known as Trashi Chhoe Dzong or Thimphu Dzong, the Tashichho Dzong is a Buddhist Monastery in Bhutan’s capital Thimphu, containing thirty temples and shrines within its walls. Prince William and Kate Middleton will visit this stunning temple. The current King’s coronation took place here in 2008 and it’s the location of the annual Tsechu Festival. A sight to behold, Paro Taktsang is a Buddhist temple located 3,120m above sea level in the cliffs of Paro Valley, Bhutan. 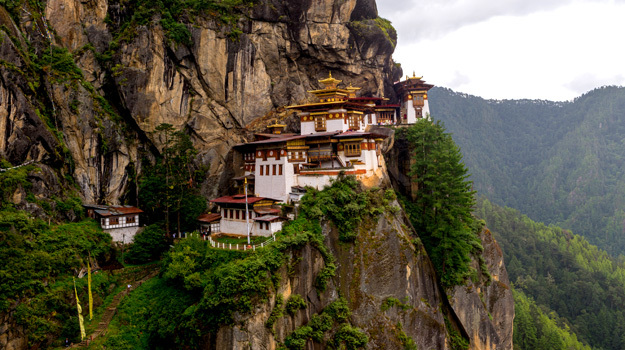 Also known as the Tiger’s Nest, it’s where Guru Padmasambhava is said to have meditated for three years, three months, three weeks, three days and three hours in the 8th century: introducing Buddhism to this Himalayan kingdom. The Royal Couple will hike the 8km trail to the temple complex on the 15th April. If you’re wishing to visit vibrant India and mysterious Bhutan for yourself, check out our Himalayan Kingdoms escorted tour! Visit India and Bhutan with the UK’s leading Asia Experts, Wendy Wu Tours. Our award winning escorted, fully inclusive tours visit all the major sights of Asia for an unforgettable holiday. India tourism, unesco heritage site. permalink.